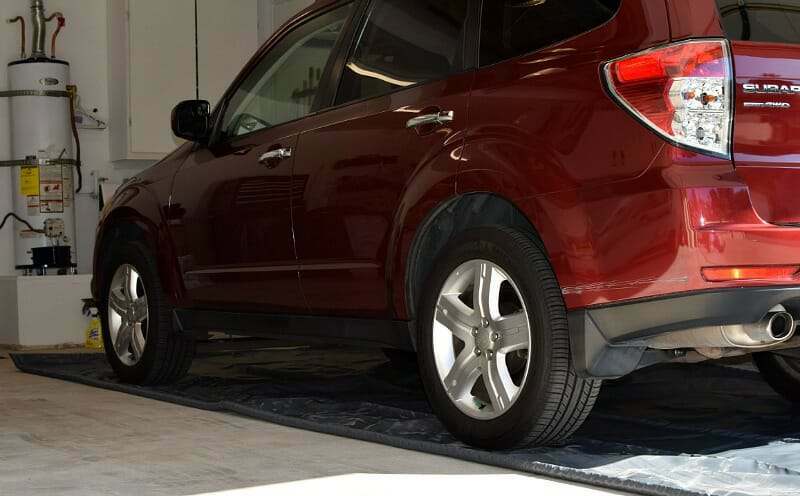 Choosing the best garage floor mat for snow and winter weather is an important consideration when it comes to protecting your garage from the icy grip of winter. The proper mat will keep damaging road salts and deicing fluids away from your bare concrete. 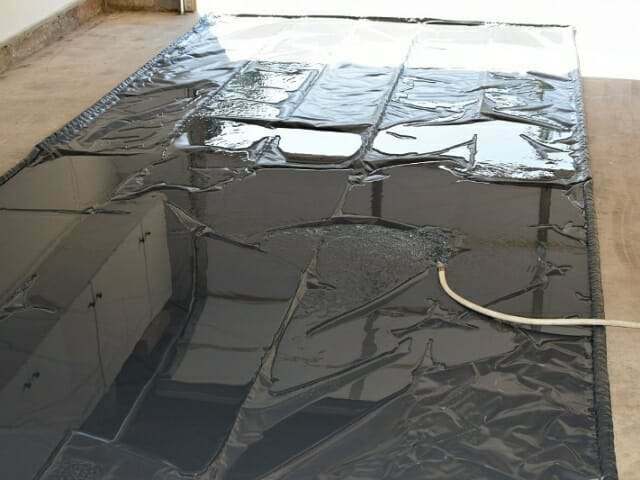 They also prevent slip fall accidents from the water that can pool up and freeze overnight on your garage floor and they do a good job helping to keep your garage floor clean. Manufacturers of winter snow mats and containment mats have made some improvements in the past year. As a result, we have updated this popular article to keep you informed with the latest information about the best winter mats for you to review. If you live in a climate with large snow falls, then a containment mat would be the best choice by far. 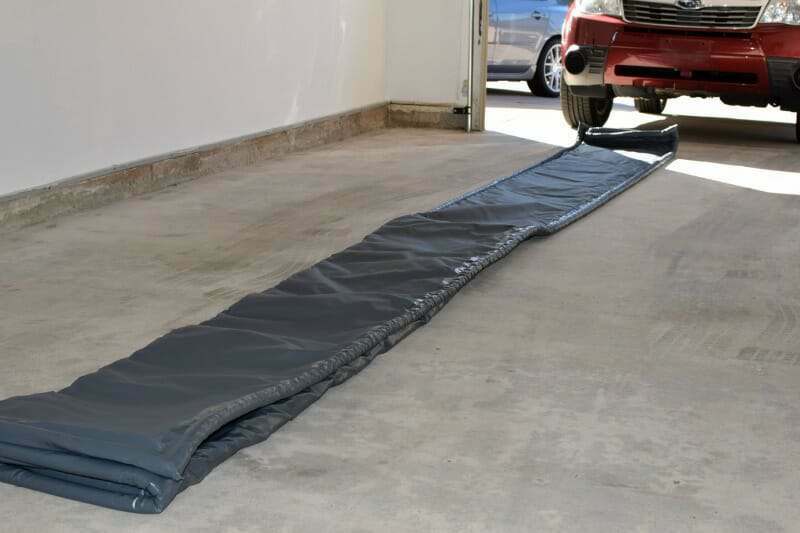 These mats are designed to hold gallons of water for those days when the bottom of your car resembles more a snow plow than your daily vehicle. Snow, ice, and water are collected on the mat instead of your garage floor. They actually contain all the liquids that drop from the sides and bottom of your vehicle, hence the name. After reviewing a variety of containment mats that are available, we have three different brands that we can recommend. The first is the Park Smart Clean Park containment mat. These were arguably the first actual containment mats and have been around for quite a while now. They still provide the nicest and cleanest look of the various containment mats available. Available in a variety of sizes from 3’x4’ on up to a very large 9’x22’, you can park something as small as a snow blower to as big as an SUV or large truck. Made of polyvinyl, these mats come with plastic snap-in borders that contain the water and snow. You can remove the liquid with a wet vac, mop, or just unclip the edges near the garage door and squeegee the water and snow out to the driveway. Available in a standard 20 mil and heavy duty 50 mil thick polyvinyl, we recommend the thicker 50 mil mat as the best choice of the two. The 20 mil mats have developed a reputation of not holding up nearly as well to repeated use and will need to be replaced sooner. You can find both the heavy duty 50 mil and 20 mil options with the best prices and free shipping here. for the tires. Just lay the additional strips within the mat to provide the extra protection from the studs. One thing we want to mention is that while these containment mats work fairly well, they don’t hold as much liquids as some of the newer designs that are available now. Also, some people have voiced frustration over having to clip the edges in for installation as well as removal of the edges for storage. There are quite a few sections to clip together depending on the size of the mat. We feel that clipping and unclipping the edges is not that inconvenient if you are only installing and storing the mats once a year. However, there have been reports of the occasional edge that can break during this process.
. These were a fairly new introduction to the market more than a few years ago now and they are still getting good reviews. 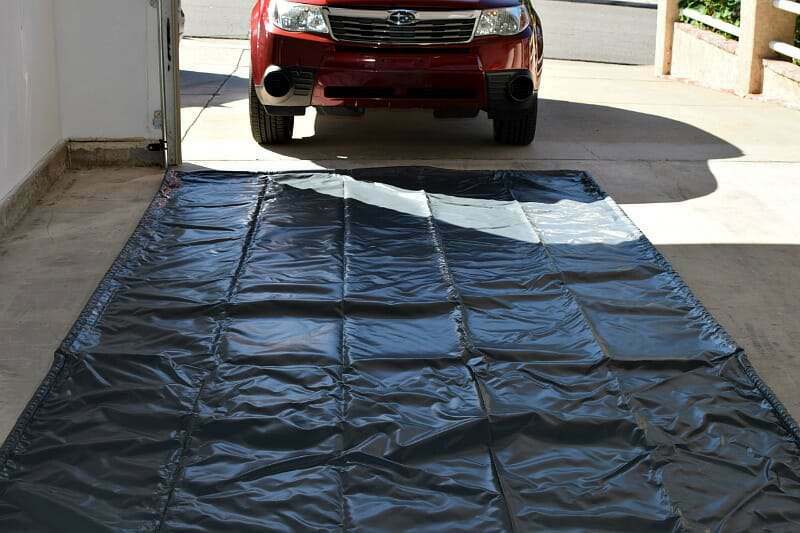 In fact, the Auto Floor Guard used to be our favorite winter containment mat. What makes these mats unique is that they are made of a very durable PVC coated Polyester Scrim fabric instead of vinyl plastic sheeting. 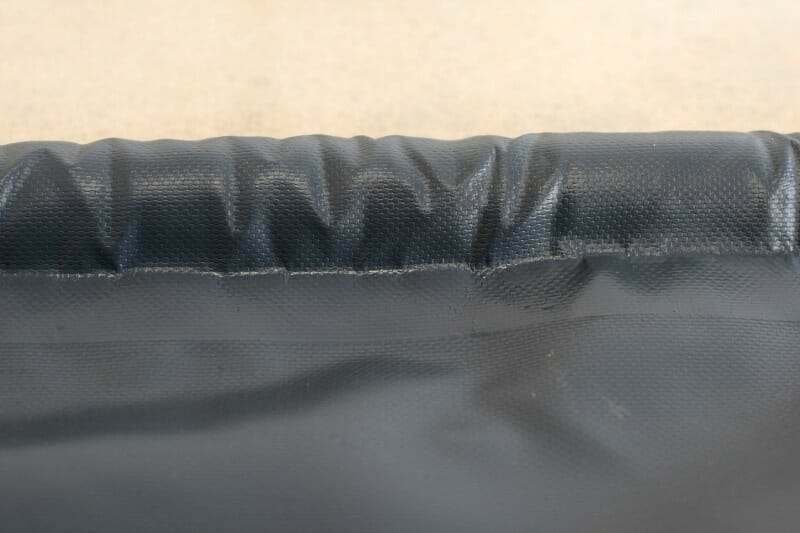 It’s the same type of material that is used for tarps in the commercial trucking industry and makes for a tough and flexible mat. Because it is made of a fabric and not plastic sheeting, it isn’t measured in mils of thickness like vinyl mats are. The edges of the mat are constructed of 1.25” round high density foam that is heat sealed into the mat. This allows you to drive over the edges without damage and the tall sides will retain gallons of water from snow and ice without fear of it spilling out onto the garage floor. 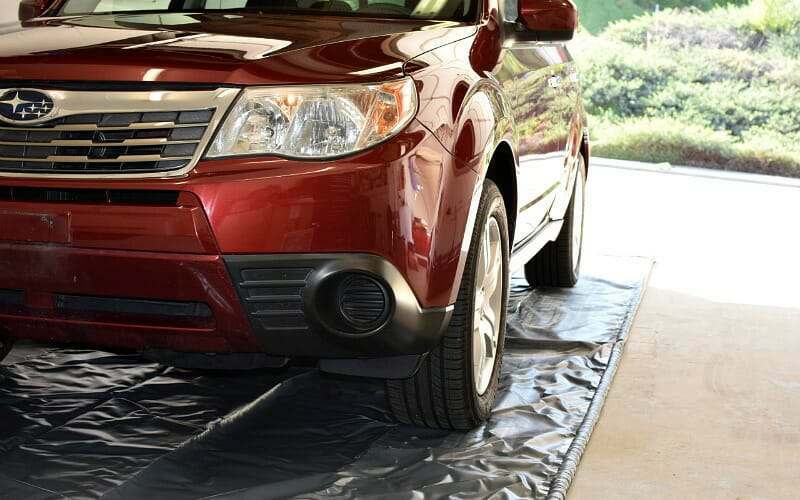 These mats are less expensive than the heavy duty Park Smart mats as well and you don’t need to assemble any parts. You just roll it out, unfold it, and you are ready to go. They also roll up fairly easy to store away again for the next winter. Auto Floor Guard has actually made some improvements to their mat for this year. The biggest change is that they are using a heavier Polyester Scrim fabric for increased durability and wear. We believe this is in response to better compete with the TruContain mat that we review below. Along with the more durable fabric, they include a free squeegee head. Additionally, they have increased their limited warranty from 90 days to one year. Again this competes more directly with TruContain. Lastly, they also include what they call their new Stay-Put-Corners. This is a large square piece of hook and loop Velcro that you can glue to each corner of the underside of the mat and the garage floor. The idea of this is to keep the corners down and to prevent the mat from bunching up if you turn the wheels of your vehicle sharply in place. While it’s a novel idea, the jury is still out on this in terms of how well it actually works. All mats come in black and have three different sizes to choose from. Compact is 7’9”x16’, Midsize is 7’9”x18’, and SUV/Truck is 8’6”x20’. 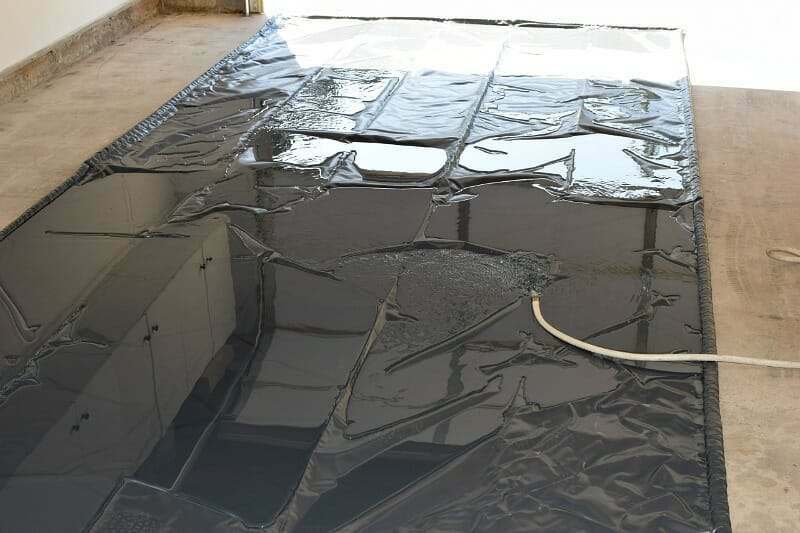 One other feature that we like about the Auto Floor Guard mat is the ease of removing liquids and snow from it. It is easier than the Park Smart mat since you can squeegee water right over the rounded edges without having to unsnap anything. They are not recommended for studded snow tires however. The TruContain Containment Mat was a brand new introduction last year and is still considered the best value all the containment mats that we have reviewed to date. There are a few reasons why we like this mat even more. Not to be outdone, however, TruContain has now released an optional heavy duty version of their already successful standard containment mat. Called the TruContain HD, this mat is manufactured with 33% heavier Polyester Scrim fabric than their standard mats. This newer HD mat was first tested in the harsher winter climate of Canada. The width of the mats is approximately 9” wider than standard as well. This was done in order to accommodate the width of most any vehicle. The heat welds for the high density foam edging are very high quality also. TruContain elected to move the welds to the underside of the mat instead of the top. This produces a nicer look and does a better job of protecting the welds from the elements. 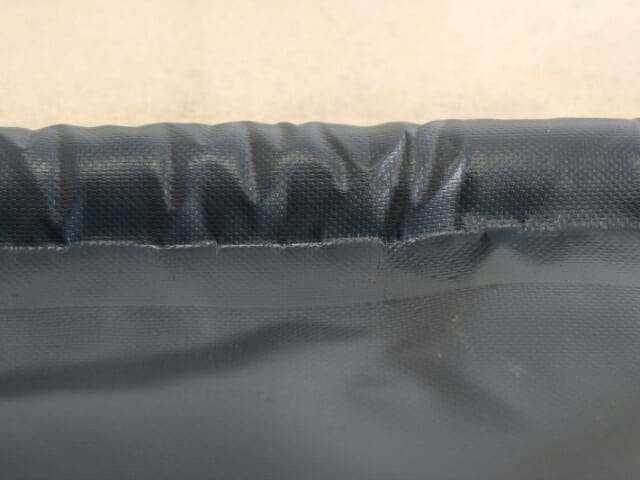 Besides the optional heavier Polyester Scrim fabric and better location of the welds, the TruContain mat also comes in a much more attractive dark grey color instead of black. 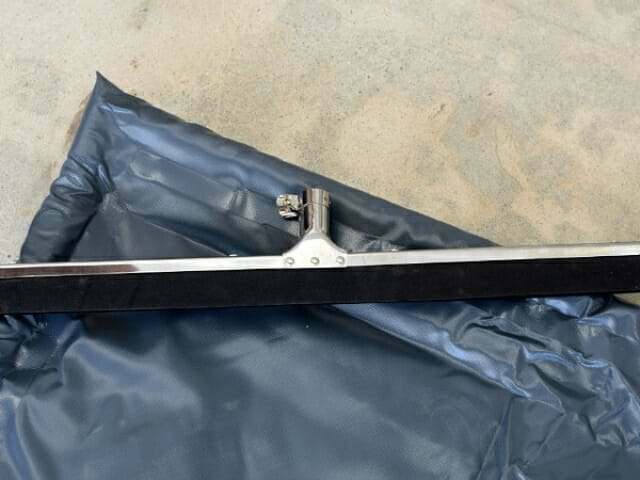 As before, they include a free squeegee attachment with each mat shipped. Finally, TruContain backs their mats with a 1 year warranty. This is all achieved at a similar price point as well. 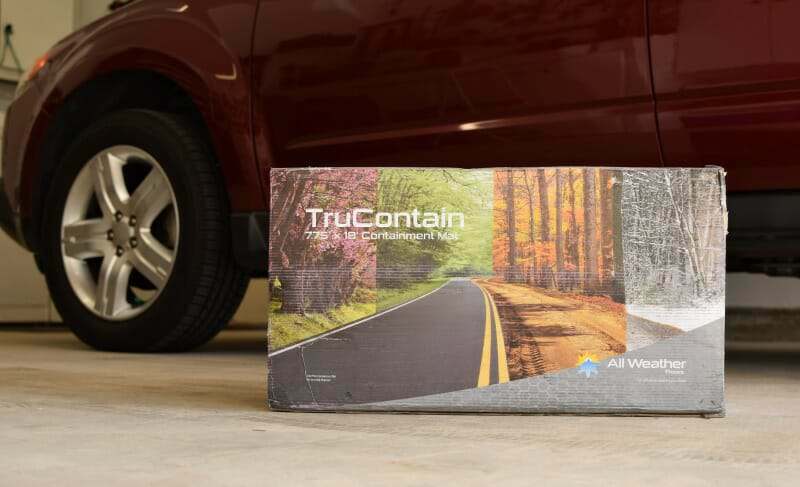 As a result, we feel TruContain is the best overall value for for a winter containment mat. You have four different sizes to choose from. They are 7’9”x16’, 7’9”x18’, 9’x20’, and 9’x22’. The TruContain HD (heavy duty) containment mat is available in 8′.6″x18′, 8′.6″x20′ and 8′.6″x22′. One other point to consider with this style of containment mat is that it is very easy to store for the winter. Just fold it long ways and roll it up like a large sleeping bag. It’s that simple. 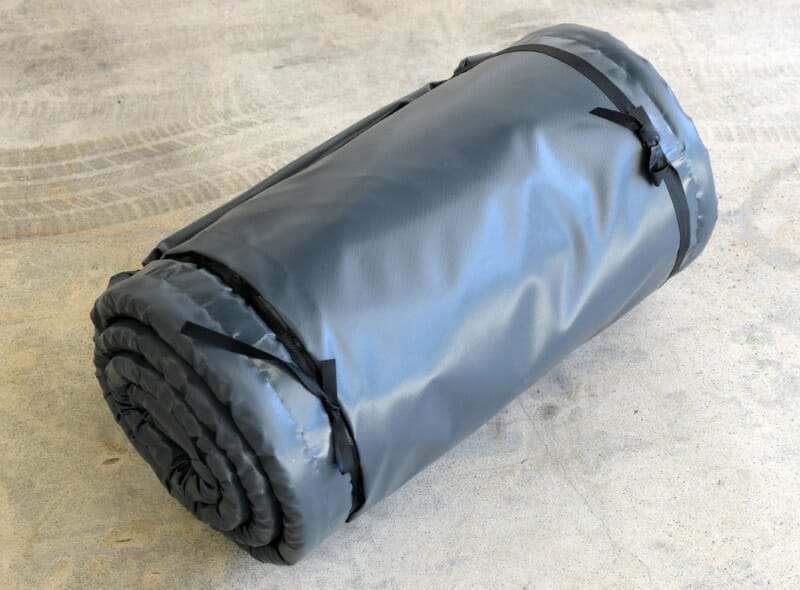 If you are from Canada and want to know how you can purchase one of these winter containment mats and have it shipped to you, there is now a company we can refer you to who can do this. CLICK HERE to visit their website. For those of you who get the occasional snow fall and don’t feel the need to contain such large amounts of water and debris, there are two more mats that are worth your consideration.
. These work well at absorbing liquids from snowmelt and provide for a soft ant-slip surface. Made with waterproof, bonded backing, these mats will not let snowmelt, road salts, or deicing fluids reach your floor. The material is made of 50% recycled fabric that can hold up to 5 times its weight in liquids. They are available in a 7.4’x8.4’ size for small vehicles, motorcycles, or ATV’s and two sizes for cars and trucks – 7.4×17’ and 7.4×20’. You can purchase them with the best pricing and free shipping here from Amazon. You can clean these mats with a vacuum once dry or use a wet vac on them when wet. You can also drag them onto your driveway and hose them down with soap and water if needed.
. Though technically not a containment mat for snow or water, the ribs do work at holding moderate amounts of liquid if you have a level floor. They can be mopped dry or use a wet vac to remove water and debris. 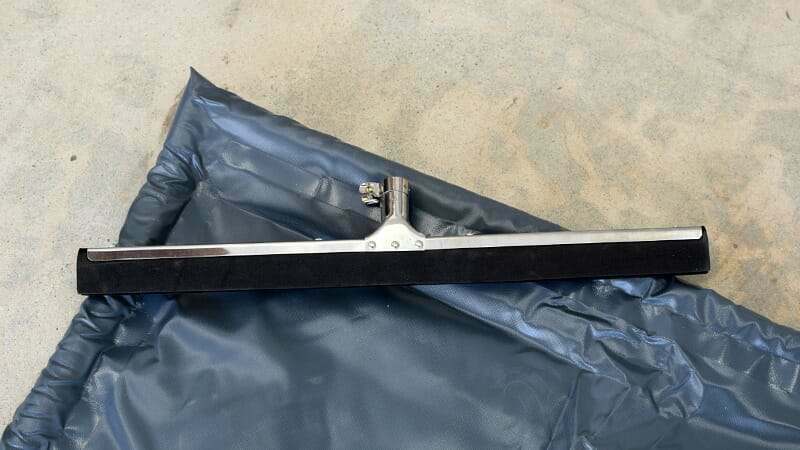 A squeegee does not work as well due to the raised ribs on the surface. A broom is a better choice. 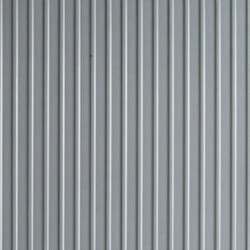 Made of polyvinyl, they are available in a variety of sizes from 7.4’x14’ to 10’x24’ and come in a standard 55 mil or commercial 75 mil thickness. The ribs help to create an added non-slip benefit as well. You can purchase them at the best price with free shipping here from Amazon. With all the talk about winter mats, we thought we would update you with what we think is one of the best outdoor mats available. 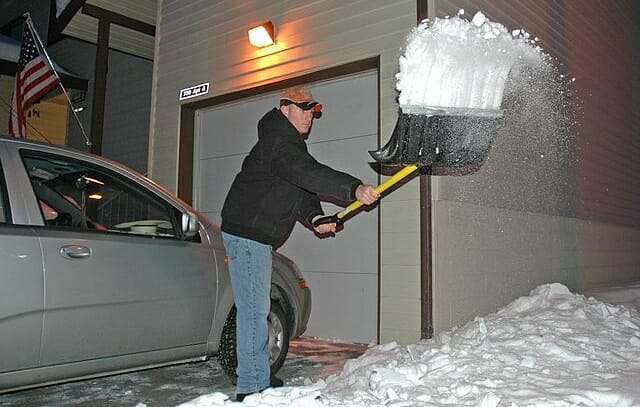 We purchased one of these before last winter and have been thoroughly impressed. Made of recycled materials, this mat does not have a rubberized or foam backing that you need to worry about deteriorating or leaving imprints on your garage floor, entryway, or porch. It is especially nice to use on an epoxy garage floor coating. The stiff bristles do a great job of cleaning the underside of your shoes from loose snow, mud, and other gunk. 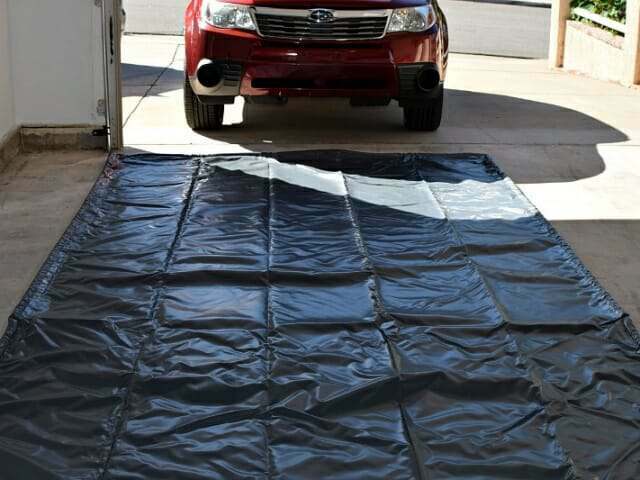 Just remember to be smart when choosing what the best winter garage floor mat is for you. If you deal with an abundance of snow then a containment mat is what you really need. Our advice is to always purchase the heavy duty or commercial grade mat if it’s an option and your budget allows it. The few extra dollars is money well spent. We’ve heard more stories from people who purchased a cheap mat that didn’t make through the winter when others are on their third or fourth winter with the better mat. If you only deal with light snow falls or water only, then the lighter duty mats such as the DryMate fabric mat or BLT ribbed mats should work just fine. Maybe that will sound like a dumb question, but will these mat will resist to studded tire? I’m in Quebec, Canada where winter are pretty hard, and I have studded winter tire. Hello Mike. No, it’s not dumb question at all. Most actual “containment mats” will not stand up to repeated use of studded snow tires. The mats that will stand up to studded snow tires are the polyvinyl mats such as the ribbed ones. They will not hold as much water, but they are easy to clean water and other debris out with a large push broom. 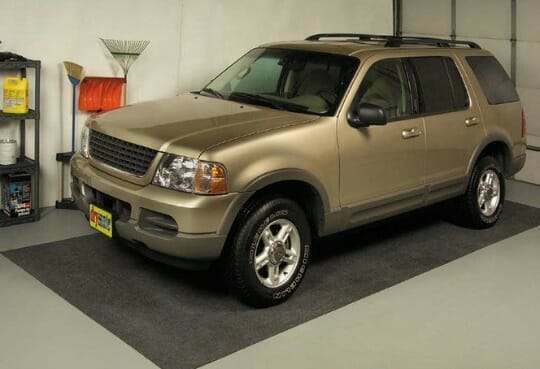 we have a two car garage with a central drain, and would like to have a single car mat (rubber) wide enough for both cars with raised edges that would direct water to the central drain and then down into a 4″ pipe under the garage that takes the water outside the home (with waterproof seal where the mat comes to the drain hole). Could we have such a thing custom made, and by whom? Hello Myles. No, we don’t know of anyone that offers custom sizes like that. Developing a seal for drains would be problematic as well. Our suggestion is to use two mats on both sides of where the drain is and just squeegee the water out the sides of the mat towards the drain. AIRE Industrial is another player with their Park It Pad. Similar to the Auto Floor Guard and Tru contain, except that they use a sealed in rope for the perimeter edge because foam tends to break down and flatten the more it is driven over. Hi Mike. Yes, we are aware of the Park It Pad. We are not the biggest fan of them, however, due to the relatively shorter rolled edges. They just don’t hold as much liquid. This can be potential problem for garage floors that are not perfectly level. It will also require cleaning them out more frequently. For our readers who are interested, you can find them here. Any reviews on the Floor Defender Pro mats? Hello Dawn. No, we have not got our hands on one yet to review. Like some others out there, the Floor Defender mats appear to have shorter edges that are not as tall as some of the other containment mats. This reduces the amount of liquid that they will hold, especially if the floor is not level.